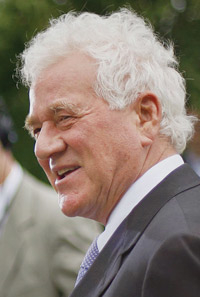 Magna's Stronach aims to develop a new concept of shared production. TURIN — Magna International has much more than a simple restructuring in mind for General Motors' troubled Opel subsidiary, which it is seeking to control, together with Russian investors. The Canadian supplier wants to try out a new business model. Magna executives are working on a plan to produce vehicles for other automakers based on GM platforms. The vehicles could be built in Opel's plants in Europe or elsewhere. "The global auto industry needs a radical restructuring," said a source familiar with Magna's plans who spoke on condition of anonymity. "In the short term, sharing manufacturing on common platforms could offer clear savings without the immediate need of restructuring at the upper level —the ownership of carmakers and brands." He said Magna plans to "expand sales and production of Opel models outside Europe, as well as possibly sharing existing and future platforms with other automakers." Magna is a partner with Russian bank Sberbank on the Opel bid. Together, they would control 55 percent of the company. GM and Magna signed a memorandum of understanding on May 30. The deal could take three to six months to close. Central to Magna's strategy is close cooperation with a GM unit in Detroit called Global Technology Operations Inc., which owns the intellectual property for all GM vehicles produced worldwide. Foreign subsidiaries effectively build vehicles under license from the unit, which was formed in 2005. To smooth Opel's relaunch, GM has agreed to lower the fees it charges for access to intellectual property. The standard fee of 5 percent of net revenues would be lowered to 3.25 percent until 2013. It would then progressively return to 5 percent by 2015. Citing German government documents, the German newspaper Handelsblatt said Opel would pay about 6.5 billion euros (about $9.14 billion at current exchange rates) for patents to GM over the next 10 years. The Magna-controlled Opel will seek clients for GM's platforms and technology. "Automakers are often reluctant to buy technologies from their direct competitors," the source said. "Magna, with the neutral position of a supplier, has a chance to smooth edges during discussions on behalf of their clients." The source said he did not know whether Magna has held talks with other carmakers. But Automotive News Europe's sister publication Automobilwoche reported last month that PSA/Peugeot-Citroen and Ford have expressed interest in building cars on Opel-Magna production lines. Max Warburton, senior analyst at Bernstein Research in London, calls it an innovative concept but possibly too hopeful. "It's a nice idea — sharing platforms and powertrains would obviously save development and tooling costs," Warburton said. "But the idea that Magna will build cars for other OEMs in Opel plants looks overoptimistic. The problem in this industry is too much capacity, not a shortage. Who are the mystery automakers that want to build their products in Opel plants?" Too much platform-sharing has its risks, in terms of getting customers to tell the family members apart. In the past, that was a major criticism of GM's platform-sharing strategy in the United States. Magna already is known for a unique business model, with its decentralized North American operations. Plant managers in its components facilities have profit and loss responsibilities. Some analysts warn that as a major supplier Magna could run into trouble competing with its own customers. But Magna Chairman Frank Stronach told a Canadian TV network June 3 that he would create firewalls separating parts making and vehicle assembly and said he has discussed the issue with some customers. "We talked with quite a few of them," Stronach said. "There's some concerns, but there's so much trading going on right now between the car companies."